If you want to give your little one a yummy foodie without spending too much and is easy to prepare, then this could be the recipe you are looking for. 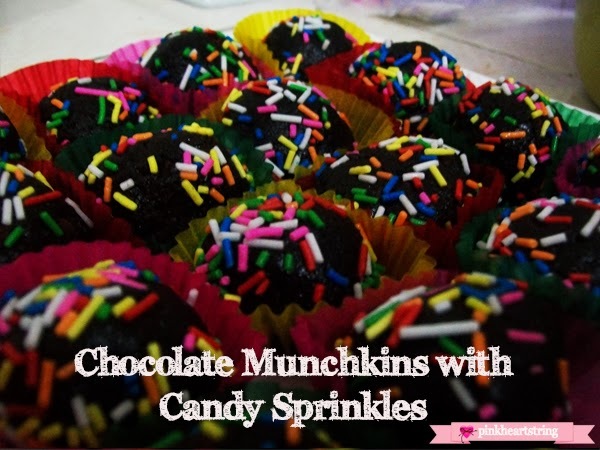 We had been making this for a long time already and everytime we find these Chocolate Munchkins in the refrigerator we always feel excited as we can already feel its delicious chocolate melting in our mouths. Well, the good news is, these are super easy to make and you will need a few ingredients to make one. 1. Crush the chocolate biscuits or use crushed Graham. Make sure that everything is crushed well so you can get a good mixture. 2. Add condensed milk and mix. Add some water to get a sticky mixture. 3. Make small balls from the mixture. 4. Roll it on candy sprinkles. You can also use nuts, desiccated coconut and other toppings. 5. Place it on small paper cups and refrigerate. It tastes better when cold and the mixture sticks well together. Easy right? Try making one and you will know what I mean by chocolate melting in your mouth! that sounds pretty easy :) do they turn cake-y like actual munchkins? Yes, they turn cake-y after refrigerating them. These look so yummy! I pinned this to make with the kids some time! Sounds delish! I love that you can get the kids involved with this recipe! These look delicious. I love how simple they are. Thanks for linking to the In and Out of the Kitchen Link Party. Hope to see you next week. Oh, I LOVE no bake recipes. They're great any time, but especially in hot weather because you don't have to heat up the house to make it! what is the measure of water? Thanks! Made this last night so quick, easy and tasty! Kareen, thank you for sharing this! I have made this so many times. Everyone that tries it, loves it! Thanks a lot for sharing! 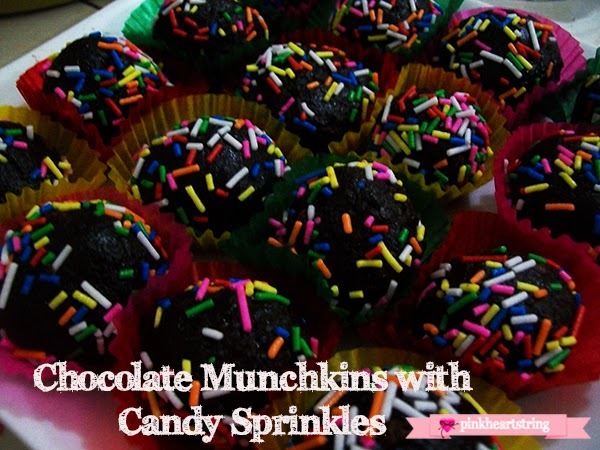 Very tasty chocolate munchkins. My son will love it! This sounds amazing and looks fantastic. Love all the colors!